In many peoples’ minds, if it is a kilt it must be tartan. I have a friend who for years insisted to me that if it was not tartan, it was not a kilt — it was a skirt! He would not be swayed. To him, this was all that made the difference. Certainly it is true to say that most kilts are tartan, but tartan has never been the exclusive cloth for making kilts. People see a solid colored kilt and often think “contemporary kilt.” And purveyors of contemporary styles of Highland attire have indeed made the solid color kilt more popular today than perhaps it has been in the past (I’m thinking here of the various outfitters offering some version of an “urban kilt” or “work kilt.”) So the impression many have is that a traditional kilt is tartan, while solid kilts are a new fad in Highland dress. 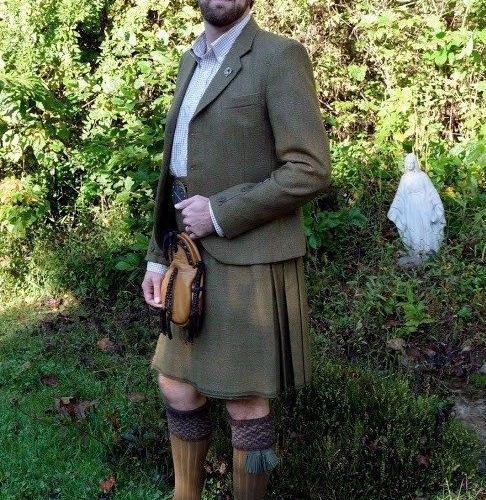 Another assumption people have is that only non-Scots wore solid color kilts. Of course the prime example of this is the Irish. Until the contemporary kilt styles mentioned above became popular, if one saw a solid color kilt worn at a Highland Games it was likely either saffron or emerald green and worn by an Irishman! Perhaps less well known is the use of solid colored kilts by Cornishmen. Prior to the introduction of the Cornish National tartan in 1963, Cornish nationalists who wanted to wear Highland dress opted for a solid black kilt. (Of course, the kilt is not part of the traditional clothing of either the Irish or the Cornish, but we are talking here of the use of the solid kilt as part of the more modern movement to develop a national costume in both countries). So a lot of mystery surrounds solid colored kilts. They are the black sheep of the kilt family — no one quite knows for sure how to react when a gentleman shows up to an event dressed in one. Is he a poor non-Scot who doesn’t have a tartan of his own? Is he trying to follow the modern urban kilt fad? Where do we place him? As it turns out, the solid colored kilt is really not new, nor is it non-Scottish. Solid colored kilts have been worn in Scotland from a very early time, probably ever since kilts were first worn. They have never been as popular as tartan kilts, but they have been worn nonetheless, without any of the modern stigma associated with them in some people’s minds. The earliest example of a solid colored kilt that I am personally aware of is found in a portrait of Sir Duncan Campbell of Lochow painted in 1635. This large painting shows the family tree of the Campbells of Lochow with Sir Duncan sitting at the base of it. It can be found in the excellent little book, Tartan: The Highland Textile, by Hugh Cheape. Sir Duncan is wearing a feilidh-mór (belted plaid, or “great kilt”) of solid red. The feilidh-mór is the earliest form of the kilt, and the first recorded mention of this garment being worn at all is in the Life of Red Hugh O’Donnell written in 1594 — only 41 years earlier. It would seem that the solid kilt is almost as old as the kilt itself! Though the Highland Scots became well known for their tartans, the solid color kilt was not a passing fad. It was still around in the nineteenth century when artist Robert R. McIan illustrated kilted Highland figures for James Logan’s work, The Clans of the Scottish Highlands, published between 1845 and 1847. His figure for the MacIntyre clan is bedecked in a striking solid blue kilt. Perhaps the most famous nineteenth century figure to sport the solid kilt is Queen Victoria’s own John Brown. He was quite famous for wearing the solid black kilt suit, complete with matching vest and jacket. Artist Kenneth MacLeay included him in such an outfit in his collection of portraits of Royal retainers in 1870. Shortly after Brown’s death in 1883, Queen Victoria commissioned a life sized portrait by Carl Rudolph Sohn which also shows him in black kilt suit. I have seen at least one Highland Dress outfitter today market a solid black kilt, vest, jacket and hose as a “John Brown” outfit! So the history of the solid kilt in Scotland is a long one. The use of solid colored kilts outside of Scotland is comparatively recent. The Irish, perhaps most associated today with solid saffron and green kilts, adopted these garments as symbols of Irish nationalism in the latter part of the nineteenth century. It was sometime during or just after WWI that the Irish military adopted use of saffron kilts for pipers in the regiments. Today, with the introduction of tartans for all of the Irish counties, and many Irish family tartans also being designed, the use of saffron and green kilts by the Irish is declining, but it still remains a good choice — and you don’t have to be Irish to wear them! Originally the cloth was a light grey, but over time shades of brown and purple were introduced. Still called “hodden grey,” this became the inspiration for the khaki color now used by militaries world wide (though the only other regiment to wear the hodden grey kilt is the Toronto Scottish in Canada). So when you are in the market for your next kilt, ask your outfitter what colors and shades are available in solid kilts. You may be surprised at the range most are able to offer you. A muted green or soft brown kilt is perhaps the perfect thing for hillwalking. And what a stir you’ll make arriving at the Tartan Ball in a bright scarlet kilt, or a deep royal blue. One thing is for certain — when you wear a solid kilt you’ll never have to worry about the tartan police asking if you have the “right” to wear it!